The early pioneers of Porter County were no different than their counterparts across other regions of the country with regard to their great appreciation for the honey bee. The western honey bee (Apies millifera) is an introduced species in North America, thought to have arrived in Virginia from England in 1622. Thomas Jefferson once wrote that the Native Americans referred to honey bees as the "white man's flies" since the insects arrived simultaneously with the European settlers. After a honey bee colony firmly establishes itself, the colony may eventually swarm if the hive becomes overpopulated. The hive's queen, along with about sixty percent of the worker bees, will leave the hive as a swarm in order to establish a new colony. The remaining worker bees in the hive will produce a new queen and continue on with their production of brood and honey. Swarming, therefore, naturally expands the range of the honey bee. It has been reported that members of some Native American tribes believed that homesteaders would soon be arriving when honey bees colonies established themselves in their territory. By the mid-1650s, honey bees colonies could be found as far north as Connecticut and as far west as Pennsylvania. In 1776, the insect had made its way to Michigan, and honey bee colonies were firmly established in Illinois, Indiana, Iowa, and Missouri by 1800. Metaphorically, the western honey bee was Porter County's first permanent European settler. "No neighbors -- so lonely" -- do you say. No, I assure you, we were not lonely -- never less so than that winter. In the first place, there is a dozen "honey-trees" to be cut and taken care of, and as if no fruit or vegetables, the deficiency is to be made up with cranberries. Then there is the venison, geese, ducks, grouse, quails, and squirrels, &c., to dress and eat; and once in five or six weeks we had "the news" from the post-office. There was no lack of employment in doors or out -- no loneliness -- no repining. We all came here with a full knowledge of what we had to do and expect, and so there was no disappointment. The Hornor party, camping in 1835, cut a bee tree, from the contents of which they filled a three gallon jar with strained honey, a wash tub and a wooden trough with honey comb, and estimated all at at least five hundred pounds. It is quite probable that, while fond of sugar, the Indians had also learned the taste of honey. The value that pioneers placed upon the honey bee is easily understood. Refined, white sugar was very scarce and thereby expensive on the frontier. 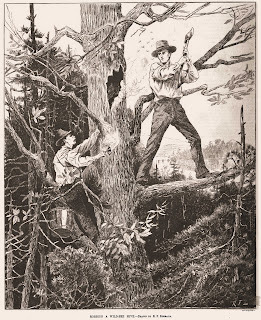 An alternative to refined sugar was maple syrup; the production of syrup, however, was tremendously labor intensive and much of the available labor on the frontier was focused on clearing land, agricultural pursuits, and constructing shelter. Producing maple syrup also required capital investment in drills, taps, buckets, and evaporator equipment such as very large kettles. The homesteader also had to have maple trees available to tap. As a result, maple syrup was also expensive when sold commercially to homesteaders. The discovery of a "bee tree" was considered to be a treat. The pioneer would have a ready-made sweetener. A surplus of honey could also be sold to neighbors or bartered for other goods and services. The bees wax from the hive would be collected and used in the production of candles, lubricants, balms, sealant, and polish. Propolis, or "bee glue," was also collected to produce tinctures; propolis was known to fight infections and heal wounds. Robbing a wild bee tree. 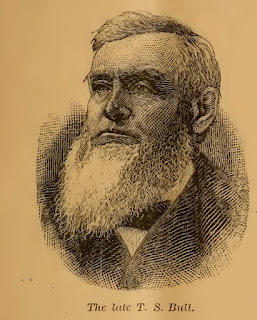 Source: Harper's Weekly, November 3, 1883. Since the honey bee generally travels no more than two miles from its hive in search of nectar and pollen, a patient "bee hunter" can determine the location of a hive by observing the bee's flight path. Bee hunters often place a small amount of sugar water (essentially, artificial nectar bait) outside. The sugar water is eventually discovered by a honey bee, its location communicated to hive members, and then descended upon by more honey bees from the hive. The bee hunter simply observes the flight path of the honey bees and follows them as they leave the source of the sugar water to return to their hive. Township resident by Charles A. Campbell, circa 1882. HONEY has been mentioned as one of the articles of merchandise which my father gathered with such care in preparation for the annual expedition to the East. To one at all intimate with the conditions of primitive times in this part of the world, it seems strange that the later historian should so often ignore this important resource of the pioneer – the vast accumulations of wild honey sealed up in the forest-trees. To this day it remains – especially in Kankakee Land – the most delicious of all the tributes that man may exact from the forest-regions that lie contiguous to the Great Lakes. We are not surprised that James Fenimore Cooper should have found not far beyond the borders of the Kankakee the actual personage whose interesting skill suggested that famous character, the bee-hunter, so unique and so striking in the fiction of the renowned novelist. For, it may be said, this was par excellence the land of the wild bee – not only because it was the land of sweet gums and sugary saps, the land of violets and daisies, of blackberries and May-apples, of golden-rod and clover, of the grape, the plum, the black haw and the wild cherry; but also because of the varied character of the country. The cool depths of the big timber-lands, the rich grasses of the oak openings, the heavy turf of the rolling prairie, followed each other with an uninterrupted succession of buds and blossoms; and to these offerings were added, in this fair domain, a million acres of lilies and flags and pickerel plants lining the water-courses, or basking in all the sunshine of the Kankakee, or circling the little lakes that lie beyond the hills. These conditions spread for the bees a feast that offered the first nectar sippings while the snows were on the hillside, and that continued to proffer the sweetness in their tinted cups until most of the autumn leaves had left the bough. This uninterrupted supply of flowers and fruits rewarded diligence with perpetual opportunity. Therefore, this is the land of the thrifty hive. A cooper kept my father supplied with casks and stout boxes, in which the honey, when received, was carefully laid away and sealed tightly with wax. Several local characters were known as bee-hunters, but most of our stock was purchased from Doctor Sandy. The latter’s success in gathering these rich stores of liquid sweetness was due both to his own habits of keen observation while collecting his roots and herbs, and in a still greater degree to the sharp eyes of several Indian women who were employed to mark the trees for him. When a bee-tree was found, it was customary for the finder to cut away the bark and write his name or initials, or make his mark, on the white wood. The contents of the bee-tree were then his property, and it had always been the strict law of the border that no man might then gainsay the right thus acquired, or in any way interfere with the title. But while it was easy enough to put your mark on any of these living beehives, it was often very difficult to find one when you were looking for it. In those days the bee-hunters were so few in number, compared with the vast range of the undisturbed forest, that a bee-tree quite generally stood unnoticed for many years, and when found was apt to contain enormous accumulations of honey. After a day spent in felling the trees and gathering the contents, it was not an unusual occurrence for the bee-hunter’s wagon to come home with three or four barrels filled to the brims. Sometimes an aged tree, when it came down, would break asunder, and a fountain of the precious contents pour out on the grass. A portion of this flood could be caught or recovered. It was placed in a separate vessel, and when they reached home a quantity of water was added. Most of the foreign matter would then rise to the surface so that it could easily be removed. The honey was still farther cleansed by boiling and straining through flannel. It was then boiled again until slightly thickened. In this manner the good housewives of the neighborhood had discovered that “cooked,” or boiled, honey, possessed a relish of rare delight, a refined joy, such as the experienced palate might know but the human tongue could never express. Quite beyond the dream of any epicure, for example, is that famous dish where the edgy tartness of cranberry sauce is smothered in boiled honey – so those old-time people will yet freely maintain. To find a bee-tree, the hunter, some day in early fall, waited until the sun’s rays had warmed the dead leaves on the ground and had filled with a mellow haze the high arched avenues of the deep wood. He then began to set out the bee-bait in some convenient place on the border of the wooded land, or where the widest patch of sunshine spread itself on the forest-floor. The bait consisted of a few drops of maple-syrup, or any other sweet substance, diluted with water and held in a cup, or scattered over a clean chip, or dropped on a piece of paper. To make sure of the prompt attention of the bees, the knowing ones would fix a piece of honey-comb on the end of a cedar-splint which was set on fire. By these means the air was loaded with an incense sweet and aromatic – a lure very seductive to insect-life. But Doctor Sandy knew of an artifice still more potent. It was a compound whose ingredients and their nice proportions he was accustomed to dwell upon in a very particular manner. “Oil of anise, twenty parts” – he would say with eyes half-shut and then wide open – “Citronella, thirty parts; rosemary, ten parts; lavender, five parts; mix well. Place only a drop of the compound on the outside of the cup; fill the cup with honey and water, one half each.” The Doctor’s method of procedure was indeed very effective; for if there was a bee within a radius of a half-mile, it rose on wing to find the cup. How marvellous the subtile emanation that could work its strange spell throughout so vast a sphere! and how refined – almost spiritual – the sense that could know such a charm and answer with responsive thrill! A common house-fly or a big blue-bottle fellow or a colony of ants might be the first to attack the sweetened water, and then a wasp would hover about. But soon, or it might be later, a real honey-bee, one and then another and another, would drop from above, and all hasten to feast themselves at this banquet laid for them. The next was the critical moment, as the bee rose to fly away home. With plainly apparent effort it struggled up a few feet, and then circling about for its bearings darted away along the traditional bee-line, whose direct and unerring course was the shortest distance to the hollow tree-trunk where the accumulated products of prolonged toil were securely concealed. To note most carefully that line of flight and to follow where it might lead, was the nice task of the hunter, the cunningest of all the arts that woodcraft may show. It might be that the hunter could run but a little way without fearing that he had turned aside from the trail; but, if so, he had but to stand and wait, assured that others hastening to the same hive would soon mark anew by their flight the lost line of direction. In this way, holding to a straightforward course, in time his practised eye would discern the aged tree where a hazy cloud of the honey-makers revolved perpetually before some knot-hole, the open door to the hive. One day Doctor Sandy and I were returning home along the Pottowattomie trail. We had spent the morning and a part of the afternoon at a certain huckleberry-patch where the berries were always large and fine, and each of us had brought away a full basket. We stopped to rest at a point where the path approached very near to the marsh. Stepping aside into the woods a few paces, we came to the top of one of those sand-knobs that here and there rise boldly from the edge of the bogland. We sat down on a log where we could enjoy a good breeze and at the same time take in a wide view of the Kankakee. Far off in the marsh lay a small island with a few large trees and an area of pawpaw shrubs. The Doctor smiled, as he began to recount his experience in that place years before. In those days he had observed that whenever he had set out his bee-bait along this part of the trail, the bees would invariably rise and strike across the marsh in the direction of this particular island. The latter was too far away for him to know that the bees actually stopped there, and the approach was of such a nature as to make it extremely difficult to reach the place. The bog was of just that consistency that will not support the human foot, and yet was so dense with matted vegetation and loose soil that no one could urge a boat through the mass. The Doctor had been foiled several times in the attempt to reach the island, until one day, stopping on this very sand-knob to rest and enjoy its elevated view of the region, he chanced to observe a she-wolf not far away parting the reeds at the margin of the wet land. With now and then a little leap or hop, it worked its way by a zigzag course far out into the marsh and toward the island, apparently walking in the water without difficulty. He had not previously thought to notice that a narrow belt of pickerel plants, arrow leaves, and lizard tongues – that seldom grow well except in shallow water – extended as far as he could distinguish them, and he thought to the island itself. The wolf was making her way where they grew. Doctor Sandy felt inclined to try the place and see whether there was not a path there which he himself could traverse in safety. But he had no gun with him, and he feared that the wolf’s den was in the island. If her young were there, an encounter with the excited and angry dam would call for arms. However, he came another day in company with an Indian, this time fully prepared to investigate the wolf’s path and to secure the honey, if his surmise concerning the location of the bee-tree should prove correct. He found that shallow water covered a firm ridge of sand and gravel, affording safe and easy passage by a meandering line, whose location could be determined quite readily by a slight variation in the color, or tint, of the vegetation. The path was also marked by the evidences of its having been much used, and recently by some animal that might have been a cow, judging from the deep impression made in the vegetation. Most of these matters were cleared up as soon as Doctor Sandy and his companion had set foot on the island. As for the honey, the smell of it was in the air; and the bee-tree itself, or what was left of it, was in plain sight. But they had come a day too late. Another hunter had discovered the rich stores and had knocked off patches of the dead bark, and although he had not written his name, he had plainly left his mark. In fact, the one that had profited by the Doctor's delay was even then at hand and busily at work. The tree containing the hive was an old one, now dead, and, indeed, so far gone in decay that a strong wind had broken off the top part. The trunk had given way in just the place where the hive was located, so that a portion of the honey had come down to the ground. A little black bear had followed his nose all the way from the mainland and had at once entered his claim to the contents of the tree. The bear had found the bees actively engaged in transporting to a place of safety the precious treasure now so rudely exposed to the weather. He had evidently lost no time in making up his mind to assist them, and thereupon had devoured the portion that had fallen to the ground with the upper part of the tree. He had then climbed the stump and dived in at the top. Only a little of that part of the bear that had gone in last was visible when Doctor Sandy and the Indian arrived. They soon saw that it was a half-grown cub that had robbed the bees’ nest. The little fellow was so absorbed in his feasting that he had failed to observe their approach. And in truth, when he had worked himself up out of the hive in response to their heavy pounding on the tree-trunk, he was not in any condition to see, or even hear, what was going on. His head was so completely plastered over with honey and dead wood and bark and even grass and leaves, that his eyes were sealed shut and his ears quite effectually stopped; nor could the vigorous use of his paws at once relieve him of blindness and deafness. The Indian continued to pound on the tree-trunk, begging that the bear should not be shot; and the latter, notwithstanding the bad mix-up in its affairs, began to descend tail first – if anything without a tail could be said to come down in that way. The Indian drew his hunting-knife. With such a weapon his fathers had met Bruin, and he would follow their example. It was an easy task, and yet it required a well-delivered blow. When the animal, growling and whining, had descended to a point within easy reach, the blade was driven home to the hilt. The bear, clutching at the weapon, lost its hold and rolled over on the grass, but could not rise again. Had it not been for its blindness, it doubtless would have dropped to the ground before coming within reach of the Indian’s knife; the latter might then have had a very different task. But, as the event transpired, the bear was not hard to deal with, and quickly lay still in death. “It was a strange sight,” said Doctor Sandy, “for surely no stickier little cub ever turned its toes in air!” They divided the bear-meat between them and left the bees to do what they could with such of the honey as might still remain in the ruined hive. Before leaving the place the Indian discovered that the footsteps of the wolf led across the island and in the direction of a big sycamore that rose from a little knoll in the marsh far beyond. The reader remembers I said that [Joshua R.] Essex was a great bee hunter and to my mind he was. But he had many close rivals in hunting for wild honey. Now I will tell you of one of the shrewdest bee hunters that ever operated in the Kankakee Swamps. He said that “there are tricks to all trades” and a stunt that he pulled off and got away with, or rather a “joke” as he called it surely proves the assertion of good or evil repute of past Sawyers or Sawyers yet to grow. Henry B. Sawyer was related to the Mr. Sawyer who many years ago ran the Eatons Ferry [located where Baum's Bridge Road crosses the Kankakee River] and of which I will speak later. This young hunter who originated in Kentucky but later at Big Log, Indiana, has friends who have determined that he is a natural born hunter (Kentucky produces a large crop of such). Sawyer was long armed and amiable. From many years, of practice in hunting and shooting wild fowls, deer and wild hogs and other game which inhabitated the Kankakee region had a fairly correct notion of his own about hunting. Many of the sportsmen from the city would employ him and turn over their camp to him and at night he would teach them local geography of the Kankakee region. In a few years he became known to almost all the sportsmen in the nearby cities. The business of a guide in those days was to push a boat through the swamps, bayous and sand marshes with one, and sometimes two, hunters in it. At times there was much hard work to perform, especially in the fall hunt when the water was low. In a year or two he grew tired of this business and his thoughts seemed to consist as far as might be to avoid work. And here he invented his practical “joke.” Sawyer was struck on the idea of bee-hunting. As he was well known by all of the old bee hunters along the Kankakee he was welcomed as joyously at a bee hunters cabin as if he were a long missing brother. He was at once made to be at home in the bee hunters cabin on Long Ridge, whilst the old hunter entered with a friendly rivalry with the young hunter in the giving of advice and information. After visiting a number of the old-time bee hunters who resided among the sand ridges along the river, one of them was Honey Bee Sawyer. He thought he had the secret so he began looking for wild bees that stored their honey in hollow trees which were called bee trees. Honey sold at a good price in those days as there were not many hunters engaged in the business. When Sawyer began hunting the wild bees it was in the Autumn of “59”. At that time there were several good bee hunters in the swamp among whom I might mention the Steven brothers, Marion and Filander, Harrison Dolson, Joe Cason, Had Folsom, Charles Cannon, and a score of others that were very successful bee hunters. They were all old timers who had followed the business for years. Sawyer was green at bee hunting as I said before, but he hit on a scheme that worked and laid the old bee hunters in the shade. He was always a lucky hunter. Good luck seemed always at his hand. No matter what the game was he pursued, he always was sure to bag it, and so the same luck followed him in the bee hunting business. He found two or three trees, cut them, and they proved good, getting from sixty to one-hundred and fifty pounds per tree. Being a good season for honey, as there were lots of wild flowers for the bees to work on, Sawyer concieved the idea to mark every tree that he found that had a hole in it, to mark them all bee trees, generally picking on trees that were easily climbed. He had a pair of climbers made something on the order that telegraph linemen use. He had everything in readiness and just as soon as the frost came and killed the flowers so the bees would have to work on bait he was ready for them. As I said nearly every tree with a hole in it had his name on it and it is very seldom that you hear of a marked bee tree being desturbed. Before close of the bee hunting season Sawyer went around to all the trees that he had his name on, climbed them, stuck some honey-comb inside of the tree and smeared honey all around the hole so that all the neighborhood bees would work on the honey, passing in and out of the hole in the hollow tree. This the bees will do late in the Fall when the flowers are gone. After baiting about sixty-five or seventy trees in this way, having three or four live trees, genuine bee trees, he announced his trees for sale and in a few days he had his victim coming. Some settlers from the ridges, hearing of the result of some of Sawyer’s bee trees, concluded there was a chance for speculation, so some of them visited the young bee hunter who had a shanty on Buck’s Ridge, with a view of buying some of his trees. As good luck would have it, it was a warm, sunny day in the middle of October and the bees worked on bait nicely. Sawyer took them through the swamp, over ridges and showed them his stock of bee trees. The bees were working strong, going in and out of the trees, indicating a strong swarm. Sounding the trees with the pole of an axe gave them some idea as to the hollow that the tree might contain. After examining the trees, the party returned to the cabin late in the afternoon tired, wet and hungry. The trapper who was shantying with him had a kettle of stewed duck, boiled potatoes, bread, butter and coffee, which made a fairly good supper. Sawyer asked them three dollars and fifty cents a tree and showed them the honey that he took out of a tree that he cut. He said he had sold six dollars’ worth of honey and if they doubted his statement they could ask Mr. Smith, the man who helped him cut the tree and take the honey out. The settlers hesitated for awhile, but finally said they would give him two dollars and fifty cents a tree for sixty-five trees. There were three trees on the north side of the river they did not want. 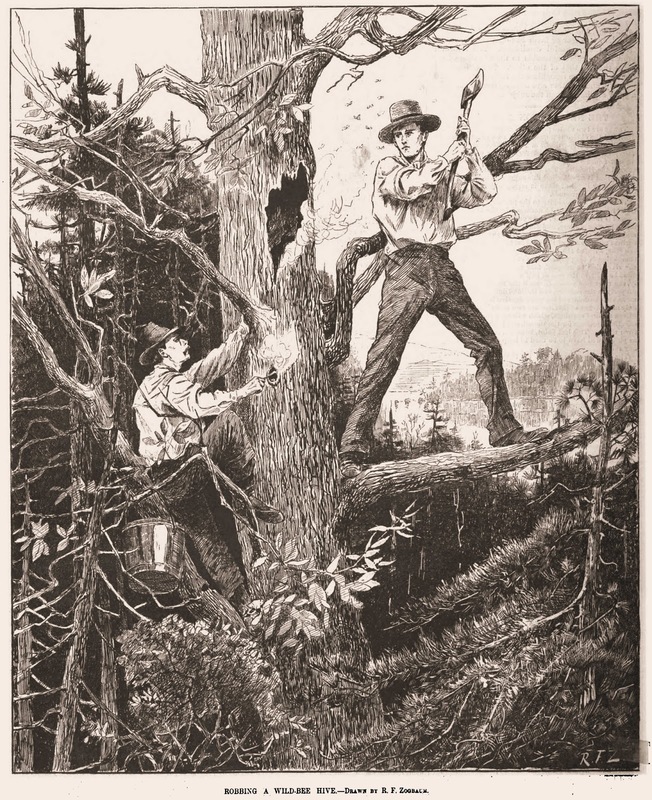 Sawyer did not want to miss a sale so he said that he would cut two trees near the cabin and if they did not get more than one hundred and fifty pounds from the two trees he would take the two fifty. And if there was more than that they were to give him the three fifty. To this they agreed. They went to cut the trees and from the first one they got a little over one hundred pounds of nice honey. The other tree was still better. They soon closed the deal. Sawyer was to help them cut the trees and the time was decided on the first freeze up when the ice would carry them safely, as that would be the best time to get around in the swamp and get the honey out. The bargain was closed and Sawyer received his money, two hundred and twenty-seven dollars for five bee trees; whilst the sixty trees contained nothing but the hollows. Not a bee in the whole sixty trees or for a long time afterwards. This was known as the “hollow tree sale.” Just before or about the time of the first freeze Sawyer left the ridge and a paper informing the settlers that all kinds of things happen in the Kankakee Swamps, he took the map of the Kankakee valley and departed. A few days later the settlers came and had a bee tree cutting. They cut several trees and did not find any honey nor bees but found a piece of honey-comb on a string inside the tree. This led them to believe that they had been tricked. They went to their homes much wiser, but with no honey. What they said of their experience was never known. A few days after this an old bee hunter asked one of them how much honey they got. He drew a long hunting knife and threatened the inquirer. The other settlers were questioned not at all. It was one of the shrewdest tricks ever pulled off in the history of the Kankakee Valley. His fame as a bee hunter went abroad all over Northern Indiana and he was thence after known as Honey Bee Sawyer, and this done on his achievement is not dimmed or forgotten. Father [John Werich] was quite a successful bee hunter and in early days kept the home supplied with wild honey all the year round and from him I got my early training in bee hunting. Although I never hunted for bees very much yet it is one of the sweetest hunts that a man can engage in. I never found very many bee trees and what I did find I found mostly when I was not looking for them. When a boy I used to go with Father when he went bee hunting. In the fall of the year after the frost had killed the wild flowers the bees would work on bait and by putting some honey-comb, stuck on a stick, in some open place, then watch for the bees, and if there are any bees within a half mile they will come to the bait and after they have loaded themselves with honey they will rise, circle around once or twice then start straight for home. Then the hunter gets the line on the direction of the tree. Possibly many of you have heard, the old saying, “Straight as a bee line.” Well, this is where that old saying originated. A bee never flies a crooked line to its home when loaded. A variation of the tale of Honey Bee Sawyer swindling residents in the Kankakee River area of honey also appears in the May 26, 1956, issue of the Chicago Daily Tribune. Joshua R. Essex, mentioned at the beginning of Werich's story, was commonly referred to "Essex, the Beehunter" since he was considered by the locals of the community to be "one of the greatest wild bee hunters that ever hunted the Kankakee region." He was born in England on July 22, 1832, the son of Jesse and Mary Essex, and migrated to the United States in 1855. Essex arrived in Porter County in the late 1850s and began a partnership in hunting and trapping with Joel G. Gilson in 1859. Essex and Gilson would construct a log cabin on rise known as Butternut Ridge very near the Kankakee River along Swift Cut Off. This location is believed to be either the SW¼ of the SW¼ of Section 20 or the NW¼ of the NW¼ of Section 29 in Boone Township, along the east side of County Road 400 West as it approaches the river. The Swift Cut Off no longer exists since it was obliterated when the Kankakee River was straightened by steam dredges during the early 1900s into Marble Ditch. Essex would remain in partnership with Gilson for approximately three years and then enlisted on August 7, 1862, in Company I of the 5th Indiana Cavalry where he would serve as Quartermaster Sergeant during the Civil War. Essex was discharged from service on June 15, 1865, and returned to the Kankakee area of Porter County to trap, hunt, and pursue bees until 1880 when he retired. In his retirement years, Essex devoted his time to bee culture. He developed and reportedly patented a bee hive that he manufactured and sold to beekeepers. It has also been written that his beehive was a "great improvement over the old-fashioned bee hive." A search of United States patent records, however, fails to show that Essex was granted a patent for his bee hive. Essex would pass away on June 7, 1915; his remains are interred at the Hebron Cemetery. Another Porter County innovator in beekeeping was Theodore Spencer "T. S." Bull. Bull was likely Porter County's largest and most successful commercial beekeeper and began beekeeping in Liberty Township in 1852. His apiary was located north of County Road 700 North, directly across the road from present day Camp Lawrence; his home still stands. 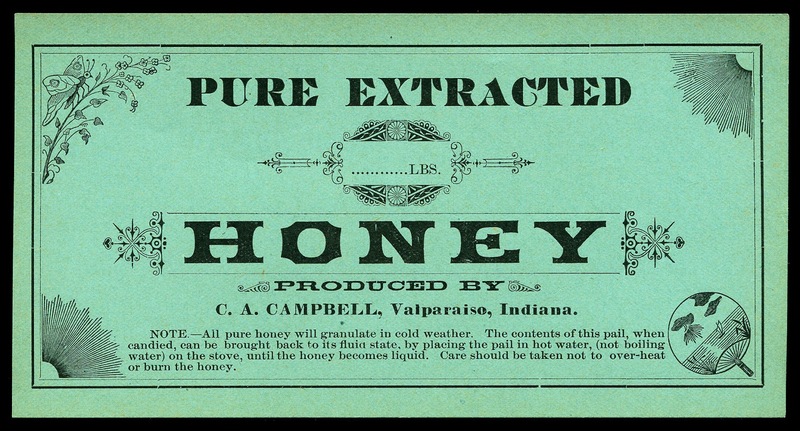 Notices published in local newspapers in 1882 suggest that Bull's apiary produced more than thirteen tons (26,000 pounds) of extracted honey that year from more than 400 colonies. 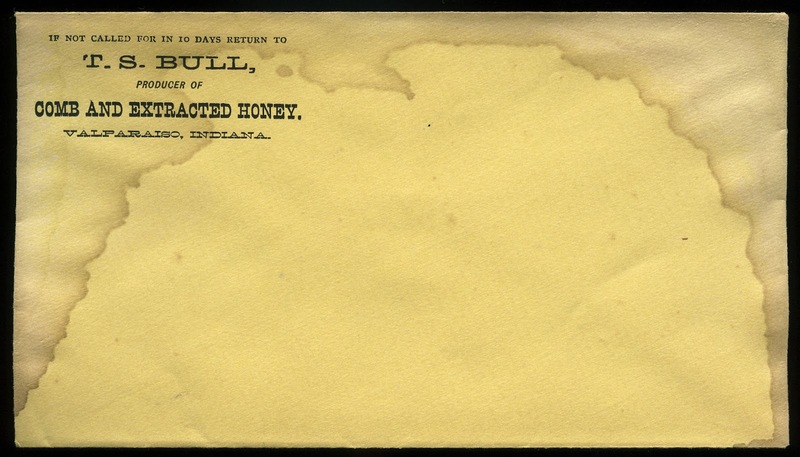 Postal cover for T. S. Bull, producer of comb and extracted honey, circa 1880s. T.S. Bull sold his extracted honey by the barrel. He would transport the barrels by wagon to Valparaiso, then ship by rail to buyers located in Chicago, Cincinnati, and New York. 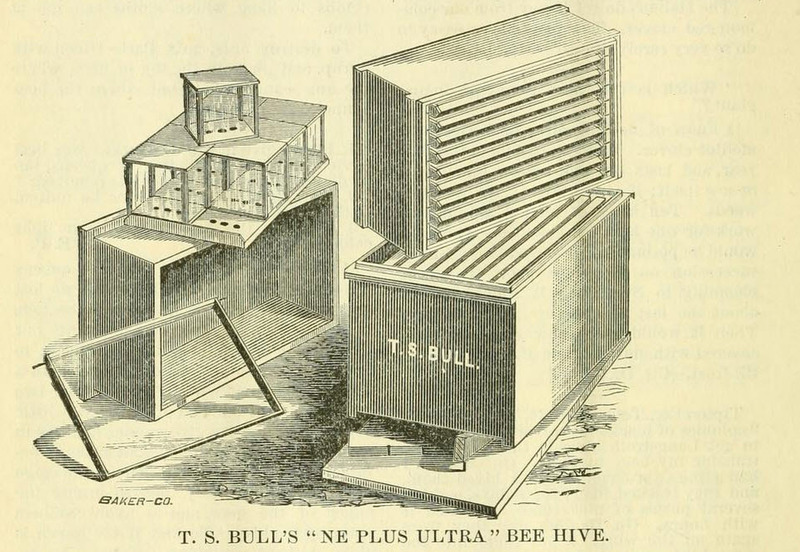 Like Essex, Bull manufactured bee hives of his own design that he called the Ne Plus Ultra Bee Hive. 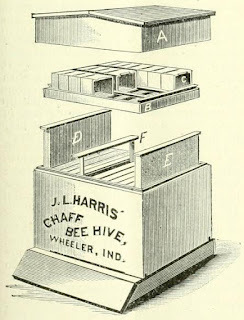 An engraving of Bull's hive shows that the honey super (box) consisted of eight smaller screened boxes, likely designed in that manner to better facilitate the extraction of honey. 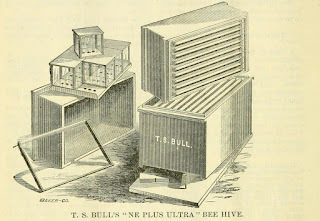 Engraving of Theodore S. Bull's Ne Plus Ultra bee hive. Source: The American Bee Journal, March 1877. 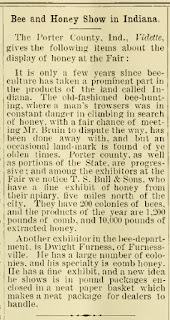 News brief concerning bee and honey display at Porter County Fair. 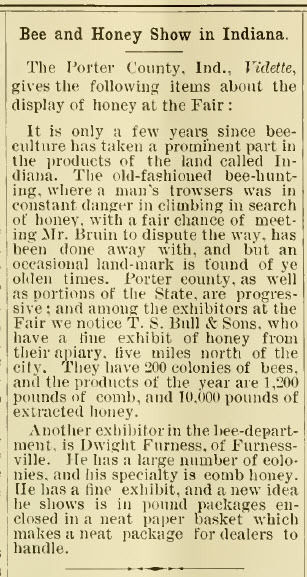 Source: Weekly Bee Journal, October 1, 1884. Another innovator in the beekeeping industry from Porter County was Joseph L. Harris of Wheeler. Born in Canada around 1836, Harris was living in the Union Township with his father, Ira Harris, as early as 1850. Though Harris was a producer of honey, his specialty was raising queens that he would then sell to other beekeepers. Honey bees are one of the few live creatures that United States Post Office Department (today the United States Postal Service) would deliver. 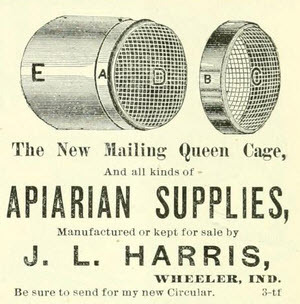 Harris developed a queen shipping cage that was approved for use by the United States Post Office Department in 1880. Harris retailed his queen cage to other individuals that specialized in raising and commercially selling queen bees. 1880, issue of the Porter County Vidette. Source: American Bee Journal, February 1880.
by Wheeler's Joseph L. Harris. Harris also created a bee hive of his own design. Like Bull, Harris' hive was based largely on the modern hive developed by Reverend Lorenzo L. Langstroth in 1852, which is the predominant hive design used today. Harris hive was "contractible" to accommodate for the size of the colony. It also consisted of insulated inner walls that better regulated the hive temperature and absorbed excessive hive moisture. developed by Wheeler's Joseph L. Harris. Source: The American Bee Journal, May 1880. Honey bees are typically not aggressive. If their hive is threatened or roughly jostled, however, then the bees will attack the perceived intruder. When a honey bee stings, the stinger (lance), poison sac, and muscles surrounding the poison sac will detach from the abdomen. The muscles will continue to contract around the poison sac and inject more venom into the victim. Concurrently, a pheromone is released that attracts additional honey bees to the victim, which typically results in more stings. In 1905, Chesterton resident Frank Wannegar was delivering a load of coal to the home of Fred Sievert. Wannegar's team of horses apparently had aggravated a hive of honey bees being maintained in Sievert's backyard. The driver and horses were soon attacked. Peter Rasmussen attempted to rescue Wannegar's team of horses by unhitching them from the wagon. In the process of releasing the hitch, a horse kicked Rasmussen in the stomach. Rasmussen would die a week later on Monday, September 18, as a result of his injury. Thus, a series of events involving honey bees led to the death of a Porter County resident. Engraving of Theodore S. Bull's included with published death notice. 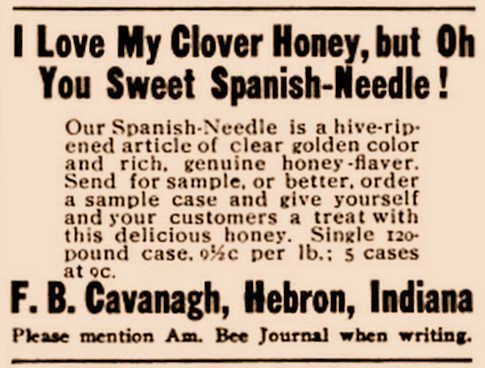 Source: The American Bee Journal, April 16, 1891. 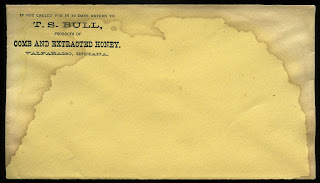 E. L. Furness & Son letterhead indicating sale of honey, 1896.
the apiary of Fred B. Cavanagh in Hebron. Source: The American Bee Journal, October 1911. Hebron apiary of Fred B. Cavanagh in 1914. Source: Collection of the Porter County Museum. Wyngarden honey farm, circa 1940. Anderson, William W. - b. January 30, 1920, d. February 14, 1997. Anderson was a former trustee of Jackson Township and founder of Anderson Orchards+. He was a beekeeper for many years and was also a sales representative for Lewis Beeware, a manufacturer of beekeeping equipment. Note beehives and honey bees engraved on William W.
Anderson's tombstone located in the Chesterton Cemetery. Bull, John Clinton - b. March 3, 1885, d. May 3, 1974. Bull was a grandson of Theodore Spencer Bull. He served as secretary-treasurer of the National Beekeepers' Association in 1917. Bull, Theodore Anson - b. May 4, 1903, d. July 7, 1980. Bull was a grandson of Theodore Spencer Bull. He maintained a large apiary in Washington Township. Campbell, Charles A. - b. December 31, 1857, d. April 22, 1938. 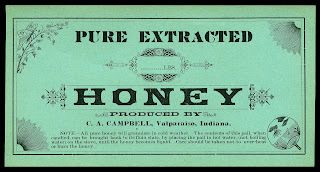 Beginning in 1881, Campbell would compete directly with Theodore Spencer Bull as a major producer of honey in Northwest Indiana. Charles would marry Bull's daughter, Olive Gertrude Bull, on September 1, 1886. He would later discontinue commercial production of honey and concentrate on the carpenter trade. 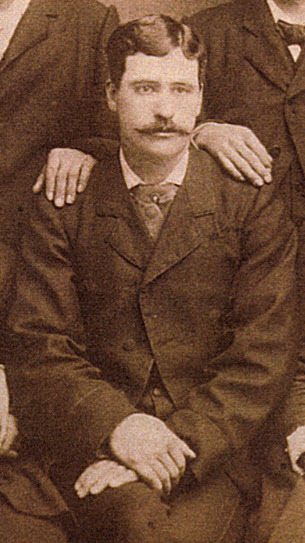 Photograph of Charles A. Campbell, circa 1890s. Clark, Thomas "Beehunter" - Clark arrived in Liberty Township in 1834. He was described as an "eccentric" who resided in the extreme northwest corner of Liberty Township. Cavanagh, Fred B. - b. 1880, d. 1914. Cavanagh was a commercial apiarist from Boone Township. It is known that he maintained more than 600 colonies at one point in time. Cottrell, Norman Edward - b. September 22, 1853, d. May 12, 1933. Cottrell was a commercial breeder of queens living at Burdick in Jackson Township in the mid-1880s. By July 1887, Cottrell had moved to Fayette, Fulton County, Ohio. Evers, Cornelius - b. January 3, 1918, d. November 3, 2004. Evers was a Demotte, Jasper County, Indiana, beekeeper who maintained an apiary near Kouts. Folsom, Hod - Hod is believed to have been a nickname, which has made the positive identification of this individual difficult. The Folsom family resided in the southern reaches of Porter County and were very early settlers (circa 1850) in the Kankakee River basin. Folsom harvested honey from naturally occurring bee trees. It is possible that Hod Folsom was William Harrison Folsom. Glancy, Thomas J. - b. July 21, 1936, d. June 11, 2010. Glancy was a hobbyist beekeeper who maintained an apiary in Jackson Township. He was also the founder of the magazine Hoosier Outdoor. Miller, Eugene Stanton - b. May 26, 1861, d. May 13, 1958; served as President of the American Honey Producers' League, 1920-1921; wrote numerous articles for books and magazines concerning beekeeping; managed a commercial apiary in Porter County from 1903 to 1955. 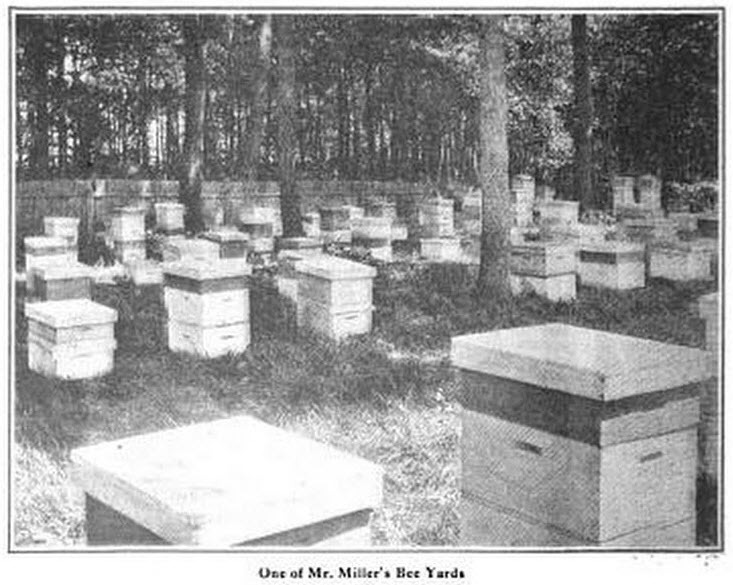 Photograph of one of E. S. Miller's bee yards in 1918. Source: The Country Gentleman, November 23, 1918. Sawyer, Henry B. 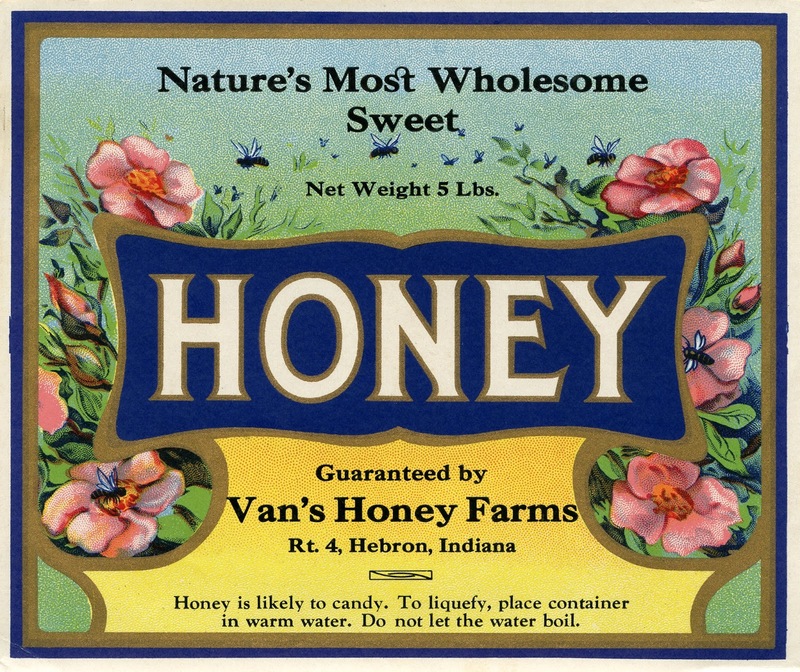 "Honey Bee" - Sawyer, mentioned in the bee tree swindling story above, was also referred to as "Kentucky Sawyer" since he was reportedly from that state. He has been described as "...long armed, gangly, and allergic to work. A major league hunter, he was in demand as a swamp guide, but this entailed movement, and Mr. Sawyer was a man who liked to recline." Schaper, Edward Ferdinand - b. January 25, 1851, d. May 30, 1909. Schaper was a proprietor jewelry, watches, musical instruments, tobacco, and cigars in Chesterton. During the early 1880s, he began to keep honey bees for commercial purposes. Shearer, Robert W. - b. September 21, 1911, d. July 13, 1977. Shearer resided near Hurlburt in Porter Township where he kept a apiary and sold beekeeping equipment manufactured by Dadant & Sons. Sievert, Fred W. - b. September 24, 1868, d. April 26, 1939. Sievert resided near the Town of Porter. Van Wyngarden, Cornelius - b. November 20, 1884, d. August 26, 1949. Cornelius was the brother of Jacob Van Wyngarden; the brothers purchased a Hebron area bee yard from Fred B. Cavanagh in 1914 and operated a successful commerical apiary there for many years. Van Wyngarden, Jacob - b. July 11, 1889, d. May 24, 1984. Jacob was the brother of Cornelius Van Wyngarden; the brothers purchased a Hebron area bee yard from Fred B. Cavanagh in 1914 and operated a successful commerical apiary there for many years. 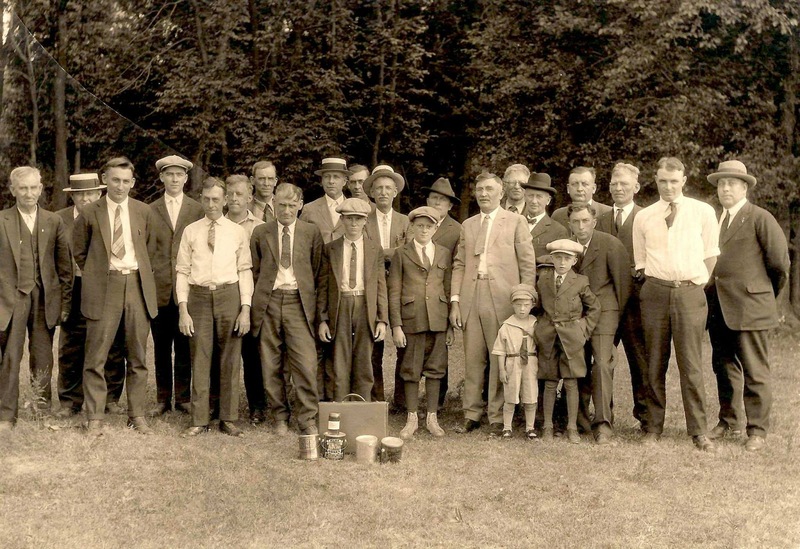 Jacob founded the Northwest Indiana Beekeepers Association, which still exists, around 1920. The Chesterton Centennial, Inc. 1952. Chesterton Centennial 1852-1952. Chesterton, Indiana: The Chesterton Centennial, Inc. 104 p.
Cooper, James Fenimore. 1848. The Oak Openings; or, The Bee-Hunter. New York, New York: Burgess, Stringer & Company. Crane, Eva. 1999. The World History of Beekeeping and Honey Hunting. New York, New York: Routledge, 704 p.
Edgell, George Harold. 1949.The Bee Hunter. Cambridge, Massachusetts: Harvard University Press. 49 p.
Seeley, Thomas D. 2016. Following the Wild Bees: The Craft and Science of Bee Hunting. Princeton, New Jersey: Princeton University Press. 184 p.
Anonymous. 1877. Editor's Table. The American Bee Journal 13(3):83-84. Anonymous. 1880. Harris' Queen Shipping-Cage. The American Bee Journal 16(2):72, 117. Anonymous. 1880. Harris' Gem Hive. The American Bee Journal 16(5):217. Anonymous. 1883. Bee-Hunting. Harper's Weekly 27(1402):692. Anonymous. 1884. Bee and Honey Show in Indiana. The Weekly Bee Journal 20(40):627. Anonymous. 1884. Statistical Table of Bees and Honey for 1884, Represented at the Northwestern Convention. The Weekly Bee Journal 20(43):676-681. Anonymous. 1887. $1.00 Queens. Gleanings in Bee Culture 15(7):242. Anonymous. 1887. Untested Queens. Gleanings in Bee Culture 15(13):490. Anonymous. 1891. Mr. Theodore S. Bull. The American Bee Journal 27(16):503. Anonymous. 1911. 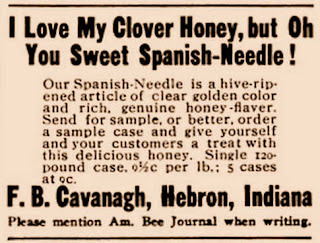 I Love My Clover Honey...." American Bee Journal 51(10):315. Anonymous. 1917. Report of the National Beekeepers' Association. The Western Honey Bee 5(3):67-68. Anonymous. 1921. Little Notes of the Industry." The Domestic Beekeeper 34(1):17. Arvidson, Helen. 2015. From the Collection. Porter County Museum Newsletter, Autumn Issue, p. 8. Baldwin, Edwin G. 1921. The Honey Regions of Indiana. American Bee Journal 61(2):51-53. Douglass, Benjamin Wallace. 1918. Honey Bees and the Income Tax: The Methods of an Indiana Man Who Has a $20,000 Honey Crop. The Country Gentleman 83(47):8, 26. Furness, Dwight. 1885. A Visit to a Large Apiary. The Bee Keepers' Magazine 13(10):249-251. Miller, E. S. 1921. Modern Methods In Comb-honey Production. The Domestic Beekeeper 34(1):6-7. Porter County Vidette, Valparaiso, Porter County, Indiana; February 12, 1880; Volume 24, Number 7, Page 2, Column 6. Column titled "Harris' Queen Shipping Cage." The Tribune, Chesterton, Porter County, Indiana; April 3, 1891; Volume 7, Number 51, Page 1, Column 3. The Chesterton Tribune, Chesterton Porter County, Indiana; April 26, 1901; Volume 18, Number 3, Page 5, Column 6. Column titled "Porter Pointers." The Chesterton Tribune, Chesterton, Porter County, Indiana; September 21, 1905; Volume 22, Number 25, Page 4, Column 5. Column titled "Porter Pointers." The Chesterton Tribune, Chesterton, Porter County, Indiana; July 24, 1913; Volume 30, Number 18, Page 4, Columns 1-3. Column titled "Tons of Honey Being Gathered." The Porter County Vidette, Valparaiso, Porter County, Indiana; August 8, 1917; Page 1, Column 4. Column titled "Beekeepers' Field Meet at Local Bee Farm." The Porter County Vidette, Valparaiso, Porter County, Indiana; August 15, 1917; Page 1, Column 4. Column titled "Beekeepers Hold Interesting Meeting Yesterday." The Porter County Vidette, Valparaiso, Porter County, Indiana; October 17, 1917; Page 7, Column 2. Column titled "Winter to be Deprived of Some of Its Sweetness." The Vidette-Messenger, Valparaiso, Porter County, Indiana; February 26, 1936; Volume 9, Page 7, Columns 3-5. Column titled "Beekeepers to Have Problem in Honey Crop." The Vidette-Messenger, Valparaiso, Porter County, Indiana; August 18, 1936; Volume 10, Section 1, Page 7. Column titled "Kankakee River and Marshes Were Sportsmen's Paradise From the Days of Indians Through 200 Years of White Men." The Vidette-Messenger, Valparaiso, Porter County, Indiana; August 18, 1936; Volume 10, Section 3, Pages 19-20. Column titled "Liberty High School History of Liberty Township: As Compiled By History Class and Instructors For The Vidette-Messenger." The Vidette-Messenger, Valparaiso, Porter County, Indiana; May 14, 1952; Volume 25, Number 267, Page 9, Column 5. Column titled "Jackson Township Man Takes On Bee Line." Chicago Daily Tribune, Chicago, Cook County, Illinois; May 26, 1956; Volume 65, Number 126, Part 1, Page 9, Columns 2-5. Column titled Kentucky Sawyer Makes Sweet Deal and Town Is Stung," by Thomas Morrow. The Vidette-Messenger, Valparaiso, Porter County, Indiana; May 14, 1958; Volume 31, Number 265, Page 1, Columns 2-3. Column titled "Miller, Planning Organizer, Dies." The Vidette-Messenger, Valparaiso, Porter County, Indiana; February 4, 1960; Volume 33, Number 180, Page 1, Columns 2-3 and Page 9, Columns 2-3. Column titled "Joshua Essex Was Expert Bee Man Along Kankakee." The Vidette-Messenger, Valparaiso, Porter County, Indiana; March 23, 1964; Volume 37, Number 221, Page 6, Columns 4-5. Column titled "Love of Bees Recalled In History of Farmer From Liberty Township," by Rollie Bernhart. The Vidette-Messenger, Valparaiso, Porter County, Indiana; March 27, 1964; Volume 37, Number 225, Page 12, Columns 3-4. Column titled "Over A Cup Of Coffee." The Vidette-Messenger, Valparaiso, Porter County, Indiana; October 29, 1974; Volume 48, Number 99, Page 7, Column 1. Column titled "Around This Area." The Vidette-Messenger, Valparaiso, Porter County, Indiana; August 20, 1975; Volume 49, Number 39, Page 20, Columns 1-2. Column titled "Portage Man Earns 3 Awards At State Fair." The Vidette-Messenger, Valparaiso, Porter County, Indiana; November 15, 1975; Volume 49, Number 113, Page 1, Column 5. Column titled "Pleads Guilty; Suspend Term." The Vidette-Messenger, Valparaiso, Porter County, Indiana; June 7, 1976; Volume 49, Number 284, Page 8, Columns 2-5. Column titled "Calms, Traps Bee Swarm." Chesterton Tribune, Chesterton, Porter County, Indiana; December 9, 2004; Column titled "Firearms Ordinance is Tabled in Burns Harbor, Hearing Draws Crowds." Chesterton Tribune, Chesterton, Porter County, Indiana; June 25, 2010; Column titled "Service Set for Thomas E. Pliske." The Times, Munster, Lake County, Indiana; July 5, 2015; Column titled "Bee Aware: Local Leader for Indiana Beekeepers Association Helping Hive Survival."